Qatar Airways has kicked off an important year in Russia for both the airline and the State of Qatar with the launch of daily direct flights from Doha to St. Petersburg. 2018 will be a milestone year for Russian-Qatari relations as Qatar Airways sponsors the 2018 FIFA World Cup and the State of Qatar partners with Russia for the 2018 Year of Culture programme, delivered by Qatar Museums. At a press conference held in St. Petersburg to mark the first day of the new service, Qatar Airways group chief executive, His Excellency Akbar Al Baker, addressed Russian and international media to convey his vision for the airline in Russia and beyond. “Touching down at Pulkovo International Airport for the first time was a significant moment for Qatar Airways. This inaugural flight represents so much more than just a new destination on our global network, it carries with it the weight of our hopes and expectations for the future of our airline in Russia and the future of our countries’ ongoing friendship and partnership for generations to come,” he said. 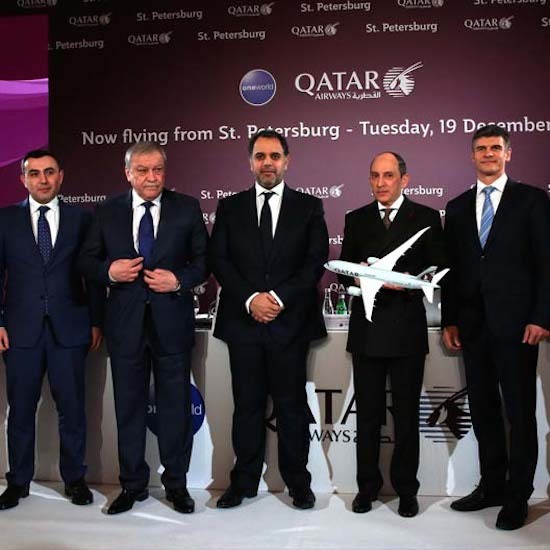 Vladimir Yakushev, chief executive officer of Pulkovo Airport, said: Qatar Airways coming to St. Petersburg was a historic step in the development of the airport and the city’s tourism industry. The launch of the new daily direct service to Russia’s cultural capital will increase the airline’s number of flights into the country to 28 per week. Already operating to Moscow since 2003, Qatar Airways recently increased its service to the city from twice daily to three times daily to meet growing demand.